La Saga d’Atlas & Axis, t.4, by Pau – French comic review by Fred Patten. La Saga d’Atlas & Axis, t.4, by Pau. Roubaix, France, Ankama Éditions, September 2016, hardcover €12.90 (60 +  pages). Lex Nakashima & I again present our conspiracy to get you to read French animalière bandes dessinées; in volume 4 ET DERNIER of the Saga of Atlas & Axis! If you’ve been following Jean-Marc Pau’s adventures of the two talking dogs since t.1 was published in August 2011, here is the conclusion. Frankly, this isn’t at all what I was expecting – so much so that I’m tempted to ignore this ending and leave the series hanging. For two reasons. Firstly, it’s much more somber and melancholy than I’d expected. I don’t demand a happy ending, but this is depressing. Secondly, the whole purpose of Nakashima’s and my conspiracy is to present French-language anthro-animal comics that aren’t likely to be published in English; and the publication of this whole series in English has just been announced! More on this below. For three albums now, Atlas (Afghan hound) and Axis (terrier mutt) have wandered the world of Pangea, searching for the Magic Bone of Khimera (whatever that is) that would prove whether wolves and dogs were created independently, or whether dogs evolved from wolves. It was easy to see Pangea as a funny-animal 10th-century Europe, with Viking raiders and the “where did dogs come from” controversy standing for the religious debates within Christianity of that time. The only thing that didn’t fit were the exploding sheep, and that could be dismissed as Pau being humorous. French anthro comic: De Cape et de Crocs. T. 11, Vingt Mois Avant – review by Fred Patten. Previously: De Cape et De Crocs is back! French anthro comic announcement, by Fred Patten. De Cape et de Crocs. T. 11, Vingt Mois Avant, by Alain Ayroles & Jean-Luc Masbou. Paris, Delcourt, November 2014, hardbound €14,50 (48 pages). The book has a back-cover quote from Hercule Savinien Cyrano de Bergerac’s 1654 comic play Le Pédant Joué that roughly translates as, “What the devil are you going to do with this mess?” An excellent question, both for this book and to indicate the setting. “The faithful rabbit Eusebius, once sentenced to life imprisonment, finally reveals his past.” (blurb) The De Cape et de Crocs series (With Cape and Fangs) has been set in a mid-17th-century Europe (and on the Moon), starring the gentlemen-adventurers Sieur Armand Raynal de Maupertuis (anthro French fox) and Don Lope de Villalobos y Sangrin (Spanish wolf). In the first “Act”, The Janissary’s Secret, they rescue Eusebius, the cutest bunny-rabbit in the world, from life imprisonment as a Venetian galley-slave. Eusebius becomes their loyal squire all through Europe (and on the Moon) in the next nine, but he never reveals how he came to be chained as a rower in a Venetian war galley. With “Act” 11, the series switches to Eusebius’ story before he met Sieur Armand and Don Lope. The setting is Vingt Mois Avant – Twenty Months Earlier. 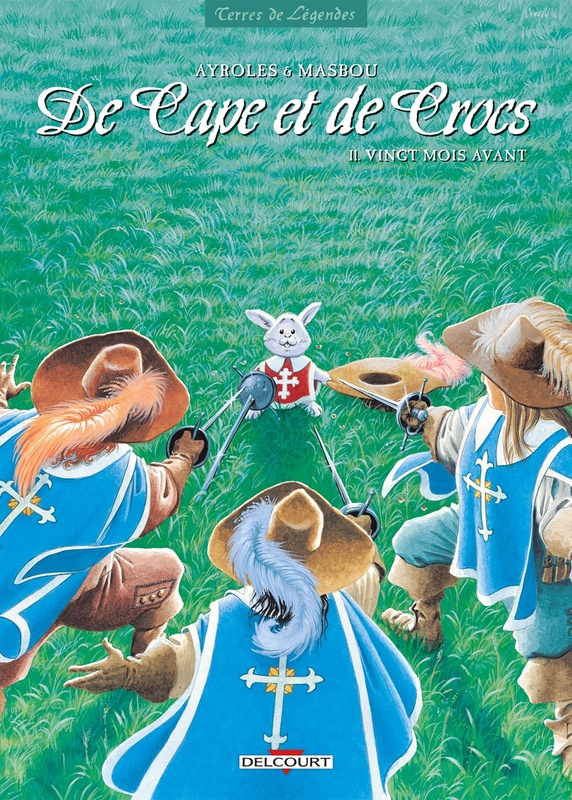 This pastiche of Alexandre Dumas’ title of his famous sequel to his The Three Musketeers, Vingt Ans Après, establishes this bande dessinee’s new direction as both a parody of French 17th-century heroic action-adventure in general and of The Three Musketeers in particular. Eusebius is not only the cutest bunny-rabbit in the world, he is the most naîve. He does not set out, as d’Artagnan does, to join the King’s Guard, but the Cardinal’s Guard! The King and the Cardinal are friends, aren’t they? Eusebius is introduced on page 1 as addressing a field full of peasant serfs as “My good men”, a well-meaning insult to them. The story, and Eusebius’ prospects, go downhill from there.